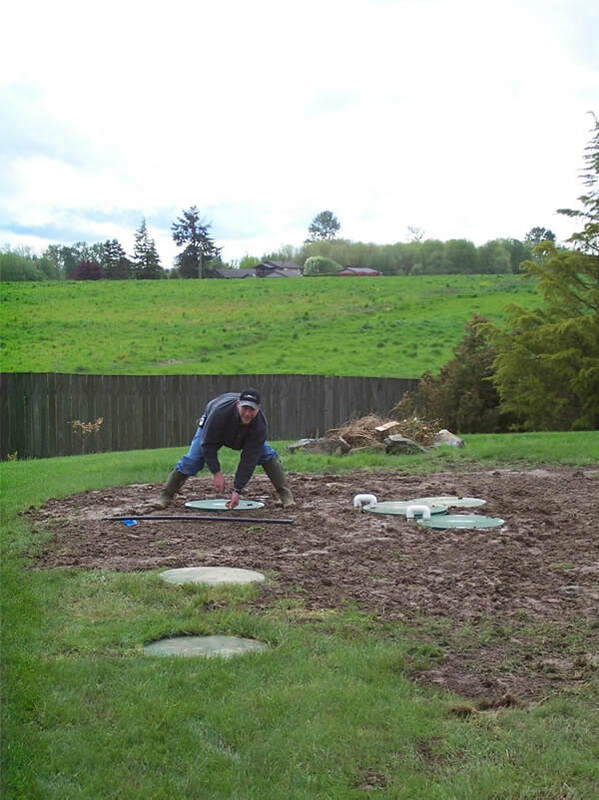 As with most things today, there is a process before installing a septic system. 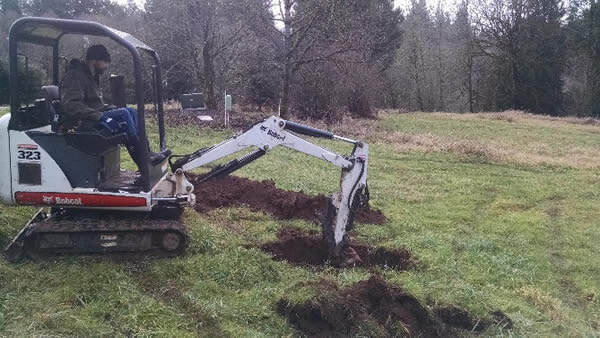 The process described here assumes you’re installing a new residential septic system. This could be on a piece of land which is vacant, or for replacing a system which has failed or needs to be moved. We’ll describe the processes we use in Clark County, WA for designing and permitting a complete system. The process for smaller projects (ie- tank replacement, drainfield expansion, etc) may not require all of these steps. On larger projects, there may be additional steps required. Before we set foot on your property, we do a lot of research. We’ll look at any previous records for the site and adjacent properties and look review about a dozen layers on the County’s GIS (mapping) system. Some properties are located in special zones which may require specific design considerations or other studies. In addition, we’re looking for any information on the location of items which may require a setback (wells on neighbor properties for example). The more we know before visiting the site, the more efficient we can be with our work and reduce the number of surprises later in the project. In addition, we will call for utility locates in preparation for digging test holes in the next step. After our research in the office is completed, we visit your property. This typically includes mobilizing an excavator to dig test holes so a soil evaluation can be performed. Prior to digging, we will walk the property with you and ask many questions. What are your future plans for the property? Are there any wells on or adjacent to this site? Etc. We’ll also take measurements from anything requiring a setback to see what areas of the property may be suitable for permitting a new system. Some of our competitors prefer to complete this step on their own time and without you on site. It makes their work faster and more efficient. However- we feel it is in your best interest to have you there with us so the margin for error is reduced. We want to see all of the site details with you and have you give us a tour. This means we have to schedule a specific day/time for our work and makes the site visit take longer, but you will end up happier with the process and end result because we do it this way. Once we have all of the preliminary site information we need, we’ll decide where to dig test holes. The soil evaluation in these holes tells us what type and size of system will be required. If we feel it will benefit your project, we will explore multiple areas on the property to see if we find any “better” soil in the different locations. 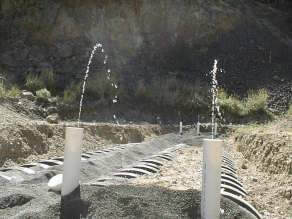 These test pits must remain open for the permitting process and you will need to ensure site safety around the holes. The analysis in the test pits is not a typical “perc” test with water. We do traditional “perc” tests for stormwater systems, but septic systems require a different analysis. We are looking for the texture of the soil (percentage of sand, silt and clay), the “structure” of the soil (how well the soil “peds” are arranged for vertical drainage) and for any “restrictive” layers which may impact liquid’s ability to drain (ie- a clay layer, seasonal water table, bedrock, etc). With all of this data, we will calculate the size and shape of the required drainfield and place stakes at the corners of the future system. These stakes help the County during their review, and assist the installation contractor find the required drainfield location during the system construction. Our last step during this first site visit is to take any final measurements needed and make a sketch which will help in preparation of the design drawings. Once all of the site information is gathered, we’ll load up the excavator and head back to the office. With all of the site and soils data collected, the design process begins back at the office. The preliminary calculations we performed on site get finalized in a spreadsheet. We use a CAD (Computer Aid Design) software called “AutoCAD” to complete the drawings. The drawings consist of a plot plan (top view) of the property as well as cross-section drawings of the different system components. Each drawing will have dimensions and specifications for the contractor to follow during construction. We’ll also prepare a formal soils report from our field notes. Once we have your design package completed, we’ll submit it for County review. We typically ask for a check from you to pay for the County application fees. We simply submit your check with the design package and the review process begins. This process normally takes 2-4 weeks. We will also prepare a “pdf” copy of the design and send it to you via email. Once we have the approved design back, we typically ask for our invoice to be paid before releasing the approval. Our job doesn’t stop with the design and permit submittal. We are here to answer your contractor’s questions about the design and inspect their work when required by the County. In Clark County, simple gravity and pump to gravity systems get inspected by the County. On all other system types, we inspect the contractor’s work prior to backfill, ensure the electrical components are functioning as required, prepare an as-built (record) drawing, complete the County’s checklist and submit these documents for review. 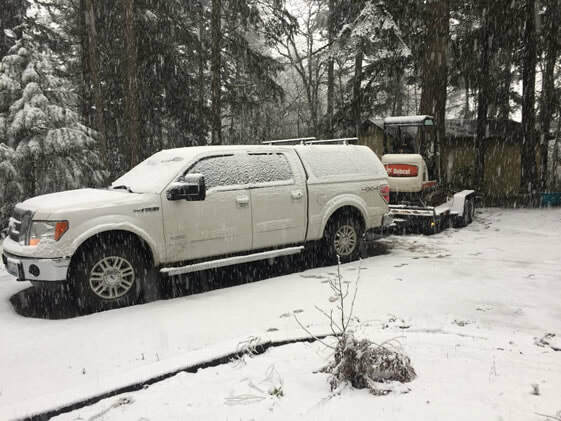 EGSD at a customer’s property after digging test holes in the snow. A pressurized drainfield being tested during a construction inspection. Keith Barto inspecting a Nuwater aerobic system after the tanks were backfilled. Very knowledgeable engineers. I saved a ton of money and got a better system than what was previously recommended. Courteous folks to work with from the first phone call until completion. True professionals. Very highly recommended.